Racing Flags include 7 piece oval track flag sets of full size, junior, and mini size. Full and Junior flag sets come pre-mounted to wood poles which are thick and sturdy. A carry bag and individual racing flags are available along with checkered flags. Click on any Racing Flags image for more information including sizes and construction details. 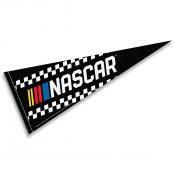 Also browse our NASCAR Racing Flags which include NASCAR Flag, NASCAR Checkered Flag, and more NASCAR Decorations.